All products are subject to availability and prior sale. All prices appearing in our catalogs or web site are subject to change without prior notice. Therm Processes Inc. is not responsible for printing errors or other errors appearing in our catalogs or web site. All orders are subject to acceptance by Therm Processes Inc.
Prices on our Web site are in effect until they are removed from the page unless otherwise noted. Images on our website are the property of Therm Processes Inc. 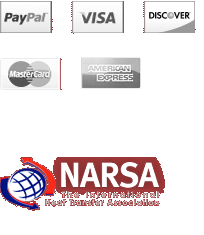 They may not be used without express written authorization from Therm Processes Inc.
Our website and catalog prices are in U.S. currency. You may use American Express, MasterCard, Visa, Discover Card or mail us a money order or personal check drawn on U.S. funds. Open account (net 30 days) is available with an approved credit application. Please contact Customer Service for a Credit Application. State and local sales taxes will be added to orders shipped within Texas. We require a valid Texas Sales Tax exemption for any tax exempt sales. Therm Processes warrants its products, to the original purchaser only, to be free of defects in material and workmanship for a period of twelve (12) months from date of purchase. Within this period Therm Processes will replace or give credit for any product shown to be defective. This warranty does not apply if the product has been damaged by accident, abuse, misuse, modification or misapplication; by damage during shipment; or by improper service. This warranty does not apply if the product has not been installed pursuant to instructions furnished with the product and/or acceptable and recognized methods of installation as stated in trade manuals. Therm Processes Inc. shall not be liable for special, incidental or consequential damages arising from breach of warranty, breach of contract, negligence or any other legal theory. Such damages include but are not limited to loss of profits or revenue, loss of use of the equipment or any associated equipment, cost of capital, cost of substitute equipment, facilities or services, down-time costs, loss of time, lodging, car rental, towing charges, telephone charges, loss of pay or for any personal injury whatsoever. In addition, Therm Processes Inc. shall not be liable for labor charges incurred in connection with the removal or replacement of the product covered by this warranty.